Low of 52. Partly cloudy through the night. 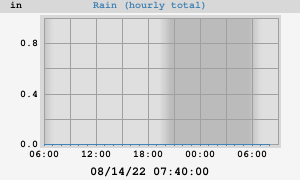 Humidity 78% in the evening, lowering to 77% after midnight. Sustained winds are light, N-NE at 1-2 mph, gusting to 2-3 mph. Sustained winds stronger in the evening. High of 81. Partly cloudy through the day. Humidity 80% in the morning, lowering to 45% by the afternoon. Sustained winds will be a light breeze, N at 1-7 mph, gusting to a gentle breeze, 2-9 mph. Winds stronger in the afternoon. Low of 53. Partly cloudy in the evening with some clouds clearing, making it mostly clear after midnight. 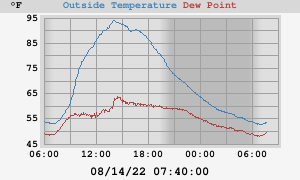 Humidity 46% in the evening, rising to 74% after midnight. Sustained winds will be a gentle breeze, N-NNE at 1-8 mph, gusting to 2-10 mph. Winds weaker in the evening. High of 80. Partly cloudy through the day. 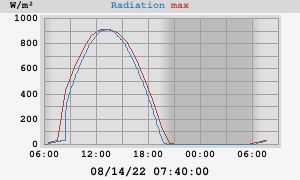 Humidity 77% in the morning, lowering to 47% by the afternoon. Sustained winds will be a light breeze, N-NNE at 1-7 mph, gusting to a gentle breeze, 1-9 mph. Winds stronger in the afternoon. Low of 52. Partly cloudy through the night. 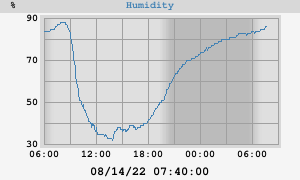 Humidity 49% in the evening, rising to 77% after midnight. Sustained winds will be a light breeze, WSW-NNE at 2-7 mph, gusting to a gentle breeze, 3-9 mph. Winds weaker in the evening. High of 75. Partly cloudy in the morning with some clouds clearing, making it mostly sunny by the afternoon. Chance of precipitation will be 1%. Humidity 80% in the morning, lowering to 53% by the afternoon. Sustained winds will be a gentle breeze, S-SW at 5-12 mph, gusting to a moderate breeze, 7-15 mph. Winds stronger in the afternoon. Low of 51. Mostly clear through the night. Chance of precipitation will be 6%. 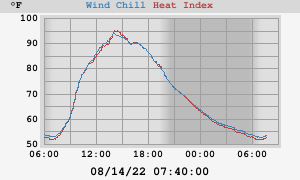 Humidity 54% in the evening, rising to 80% after midnight. Sustained winds will be a moderate breeze, SSW-SW at 2-13 mph, gusting to 16 mph. Sustained winds stronger in the evening. High of 71. Mostly sunny through the day. Chance of precipitation will be 2%. 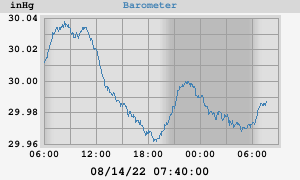 Humidity 83% in the morning, lowering to 63% by the afternoon. Sustained winds will be a light breeze, S-SW at 2-6 mph. Winds stronger in the afternoon. Low of 50. Mostly clear through the night. Chance of precipitation will be 2%. Humidity 55% in the evening, rising to 80% after midnight. Sustained winds will be a light breeze, SW at 3-6 mph. 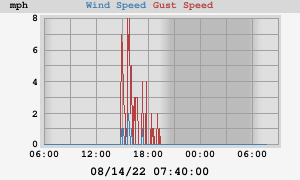 Gusting winds stronger in the evening. High of 69. Mostly sunny through the day. Chance of precipitation will be 1%. Humidity 83% in the morning, lowering to 61% by the afternoon. Sustained winds will be a gentle breeze, SSW-SW at 7-8 mph. 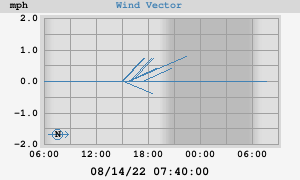 Gusting winds stronger in the morning. Low of 49. Mostly clear through the night. Chance of precipitation will be 1%. Humidity 51% in the evening, rising to 75% after midnight. Sustained winds will be a light breeze, W at 2-7 mph. Winds weaker in the evening. High of 71. Mostly sunny through the day. Chance of precipitation will be 1%. 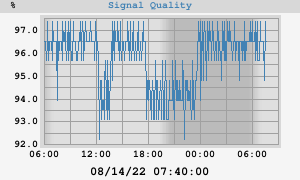 Humidity 83% in the morning, lowering to 56% by the afternoon. Sustained winds will be a light breeze, W at 2-5 mph. Winds stronger in the afternoon.